This 3-page document profiles tropical whiteweed, a common weed of agriculture crops, wetlands, roadsides, and pastures in many parts of the world, and discusses how to manage this weed in citrus groves. Written by Ramdas Kanissery, Brent Sellers, and Steve Futch and published by the UF/IFAS Horticultural Sciences Department, January 2019. 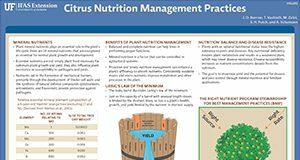 A new two-page fact sheet has been published by the Horticultural Sciences Department and the UF/IFAS Citrus Research and Education Center about citrus nutrition management practices. It was written by J.D. Burrow, T. Vashisth, M. Zekri, S.H. Futch, and A. Schumann. 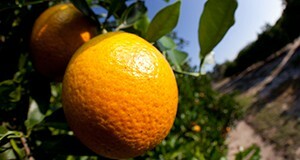 Weed management is an important component of citrus production. The selection and implementation of a weed management program can lead to both economic and environmental returns. 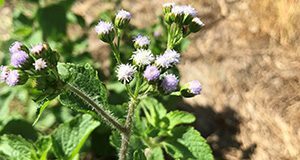 This three-page fact sheet details how to manage weeds in both young and mature groves, the differences in weed control programs between interior areas and coastal or flatwoods areas, how to control weeds after a freeze, and common ways that herbicides are misused. Written by Stephen H. Futch and Brent Sellers, and published by the Horticultural Sciences Department. Citrus trees are evergreen, never become fully dormant, and cannot withstand temperatures as low as those tolerated by deciduous trees. But citrus trees can become preconditioned or acclimated to cool air temperatures that occur in late fall and winter. One of the best ways to lessen cold injury and to hasten recovery from cold damage is to maintain healthy trees. This five-page fact sheet discusses the symptoms of freeze damage and ways to help recover trees that have been damaged. Written by Mongi Zekri, Chris Oswalt, Steve Futch, Gary England, Camilly McAvoy, Laurie Hurner, and Parker Platts, and published by the Horticultural Sciences Department. 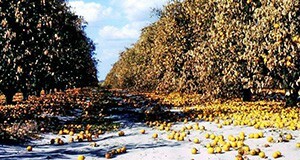 Replacement of dead and diseased trees in Florida citrus groves has always been an important part of citrus production. Today, tree replacement is more important than ever since overhead and production costs are escalating and a full stand of productive trees is essential to maximize production and profits. 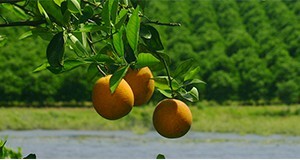 In more recent times, Huanglongbing (HLB), or citrus greening, has accelerated tree loss rates as well as the ability for growers to bring young citrus trees into production. This five-page fact sheet discusses a wide range of techniques for providing young tree care. Many of these should prove useful to Florida citrus growers confronted with the problem of managing resets. Written by Stephen H. Futch, and published by the Horticultural Sciences Department. Information about citrus rootstocks has become an important part of understanding and managing citrus greening (Huanglongbing or HLB). This selection guide covers 20 characteristics of 45 citrus rootstocks and explains its methodology in detail. This 3-page fact sheet was written by William S. Castle, Kim D. Bowman, Jude W. Grosser, Stephen H. Futch, and James H. Graham and published by the UF Department of Horticultural Sciences, May 2015. Mechanization has been the hallmark of American agriculture. Nearly 100 percent of the agronomic crops grown in the United States are plowed, planted, and harvested with mechanical equipment. Mechanical harvesting equipment for sweet oranges has been studied extensively since the 1970s and during the 2005/06 harvest season, trunk and canopy shakers harvested more than 36,000 acres of Florida citrus. Mechanically harvested citrus acreage, however, has decreased significantly since 2005. During the 2012/13 season, less than 9,000 acres were mechanically harvested (FDOC 2013). 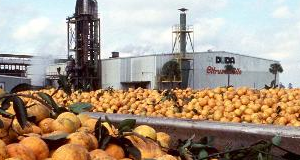 Nevertheless, development and adoption of mechanical harvesting technology is important to the long-term economic sustainability of the Florida orange juice processing industry. This 5-page fact sheet describing canopy shakerswas written by F.M. Roka, R.J. Ehsani, S.H. Futch, and B.R. Hyman, and published by the UF Department of Food and Resource Economics, August 2014. 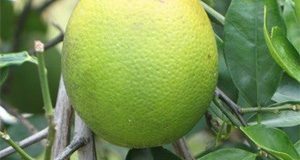 While citrus growers are rightfully concerned about restoring the health of their HLB-infected trees, more study and consideration should be given to mechanical harvesting. The costs to grow and harvest citrus have been escalating significantly since 2006, and the cost savings potential from mechanical harvesting technologies can help Florida growers remain economically viable. This 4-page fact sheet was written by F.M. Roka, R.J. Ehsani, S.H. Futch, and B.R. Hyman, and published by the UF Department of Food and Resource Economics, August 2014. 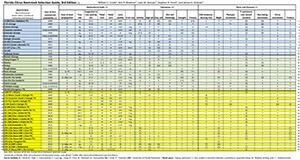 This 2-page fact sheet provides a table describing personal protective equipment requirements for several products used in citrus production. Written by S.H. Futch, L.L. Stelinski, M.E. Rogers, and J.D. Yates, and published by the UF Department of Horticultural Sciences, July 2011. Revised! 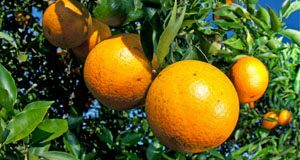 AE248, a 12-page fact sheet by Brian Boman, Darren Cole, Steve Futch, Ward Gunter, Jack Hebb, and Chris Wilson, instructs citrus grove workers in fertilizer application best management practices. Includes references and quizzes throughout. Published by the UF Department of Agricultural and Biological Engineering, March 2009. CH203, a one-page fact sheet by S.H. Futch, L.L. Stelinski, M.E. Rogers and J.D. Yates, provides a table describing personal protective equipment requirements for several products used in citrus production. Published by the UF Department of Entomology and Nematology, September 2009. CH201, a 2-page trifold brochure by J.D. Yates, S.H. Futch, and T.M. Spann, highlights the purpose of scouting, frequency, methods, grove conditions, tagging suspect trees, scout responsibilities, safety concerns, diagnostics, and what to scout for. Includes contact information for UF/IFAS Extension citrus experts. Published by the UF Department of Horticultural Sciences, August 2008. Revised! AE246, a 13-page illustrated fact sheet by Brian Boman, Darren Cole, Steve Futch, Ward Gunter, Jack Hebb, Chris Wilson, is part of the Best Management Practices (BMPs) for Citrus Grove Workers series. It covers personal protective equipment, tractor and herbicider preventive maintenance, mixing and loading, posting, important stepts to take before application, herbicide application, equipment clean up, and spill containment. Includes three comprehension quizzes and references. Published by the UF Department of Agricultural and Biological Engineering, March 2009. Revised! ABE-367, a 5-page fact sheet by Brian Boman, Darren Cole, Steve Futch, Ward Gunter, Jack Hebb, Chris Wilson, is part of the Best Management Practices (BMPs) for Citrus Grove Workers series. It emphasizes the importance of reading pesticide labels, the risks of misusing pesticides, and what is on the label. Includes a 10 question quiz and references. Published by the UF Department of Agricultural and Biological Engineering, March 2009.
greening-infected tree is identified. Includes references. Published by the UF Department of Horticultural Sciences, August 2008.